The upper left quadrant of the turboDial panel is where you find the Contact’s information, including the phone number selector, name, title, company and address information. In the example shown above there is one more link at the end of the row: in this case it’s the letter T. This last link is a custom link that can be optionally displayed with each contact. The purpose of the custom link is to give you quick access to a link of your choosing with portions of the link automatically filled-in by turboDial using information unique to the contact and the logged-in User. turboDial creates the custom link using instructions you provide in the Street Address 2 field of the User record in Infusionsoft. Note, this is the User record in the Admin->Users section of Infusionsoft. It is not a Contact record. You must provide the custom quick link configuration in the Infusionsoft User record for every turboDial user you want to have access to this feature. The Street Address 2 field is re-purposed to be used in creating the custom link since it is the User record link available to turboDial that is least likely to be needed for other purposes. However, the field can contain a maximum of 74 characters, so you must limit your custom quick link configuration accordingly. The sections below show you how to create an instruction that you can then install in the User record (Street Address 2 field) of any User in the Admin->Users section of your Infusionsoft account. You cannot mix type 1 Keyword links and type 2 Web Page links in the Street Address 2 field. Read on for the instructions for each type. This is the label for the link you want to appear at the end of the Quick Links in the turboDial panel, and it is followed by a colon. In this case the link will appear as the letter F. You could also use a different letter or multiple letters. This specifies the specific Internal Form to be opened is the form with ID # 266. Read below to learn how to find the form ID for an Internal Form. 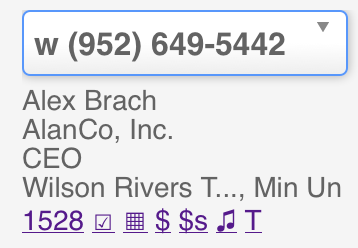 Note that when the Internal Form is opened this way it is displayed as an “Add Contact” page, but the contact information is already correctly filled in to match the contact that turboDial is focused on. You can ignore the Add Contact header. In the top Infusionsoft menu choose the “Add a Contact” option under Contact. In the Add a Contact page that opens, use the drop-down selector to choose the Internal Form you want to be able to open from turboDial. In this case the link will appear as the letter T. You could also use a different letter or multiple letters. This specifies Timetrade Activity code for the appointment type you have created in Timetrade. Read this page for more details from Timetrade. turboDial will create a Timetrade link that pre-fills these fields in Timetrade: First Name, Last Name, Phone, Email Address, Company. In this case the link will appear as the letter A. You could also use a different letter or multiple letters. This specifies the AppointmentCore appointment type code you can find when you create an appointment type and get the booking URL. turboDial will create an AppointmentCore link that includes the Infusionsoft Contact ID so that the AppointmentCore booking page will be pre-set to the intended contact. This specifies the AppointmentCore Multiservice appointment type code you can find when you create an appointment type and get the booking URL. turboDial will create an AppointmentCore Multiservice link that includes the Infusionsoft Contact ID so that the AppointmentCore Multiservice booking page will be pre-set to the intended contact. The vertical bar character is typically found on the back-slash key. You should have space for about 5 Keyword type links within the 74 character limit of the Street Address 2 field, if you use 1 character labels for each link. If you create more than about 4 Keyword type links then you may find your links are hidden off the right edge of the Contact Info section in turboDial. However you can use 2 fingers on your trackpad to scroll the information to the left and access the remaining links. In the example the link appears as the letter T. You could also use a different letter or multiple letters but be aware that the total number of characters allowed in the Street Address 2 field is 66, so make your label as short as possible. This is the booking link for a specific appointment type the User has previously setup in Timetrade. Timetrade allows the first name to be pre-filled by adding ‘firstname=’ to the booking link. turboDial will replace this code with the actual first name of the contact. Timetrade allows the email address to be pre-filled by adding ’email=’ to the booking link. turboDial will replace this code with the actual email address of the contact. You may not include multiple Web Page Links in the Street Address 2 field.